February | 2011 | E-verything! The purpose of this session was for all of us to share some of the resources we use to address issues of digital safety for students. We had a terrific session with excellent links shared for resources, websites and a digitally safe virtual space. As usual the session was recorded and as we often do we began with our thoughts on what we would like to be able to take away from the session. We moved on to discussion and resource sharing, talking about the different ways we raise and address issues of digital safety with our students. Several different types of resources were shared and discussed using both Application Share and Web Touring. Discussion was very active with participants using both audio and text chat throughout, and certainly I gained some great insights into some different approaches to digital safety. We finished up by collecting all the resource links onto a whiteboard, so that anyone accessing the recording can easily find them all in one place! The sharing of resources is always one of the things I enjoy most about many of our webinars. I also love it when people talk about the resources that they use themsleves with their own students because this provides insights for me into the way others work with their students. So giving me ideas for improving how I work with my own students. Our next session is an Edublogs “Serendipity” session on Thursday March 3rd at 23:00 GMT/UTC (6pm USA EST, Midnight BST) or Friday March 4th at 1am CEST, 7am West Aus, 10am NSW, depending on your timezone – in the usual Elluminate room. This is one of our fortnightly unconference sessions where we invite you to bring along your “hot topics” and “burning issues” for our poll on the topic of the day. If you want to propose a topic in advance then visit the Serendipity Wallwisher and add your topic. Edublogs Serendipity webinar overview – Find e-learning work! In this recorded session we talked about some of the possiblities for finding work in the online/e-learning field. 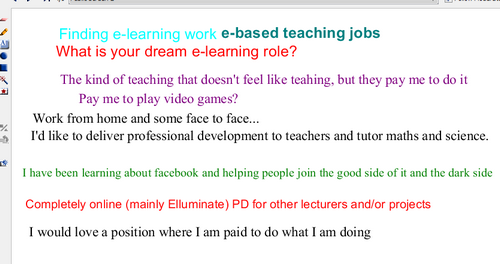 We started the session by sharing our thoughts about our own dream e-learning role. The rest of the session was spent sharing and discussing (through whiteboard, text chat and audio) our ideas about finding work in the e-learning field. This was an interesting and productive discussion with many possibilites shared. This session was particularly interesting in the different perspectives we had on the possibilities for work in e-learning. I took away an increased awareness that often we might need to create our own job and then “sell” it to someone! 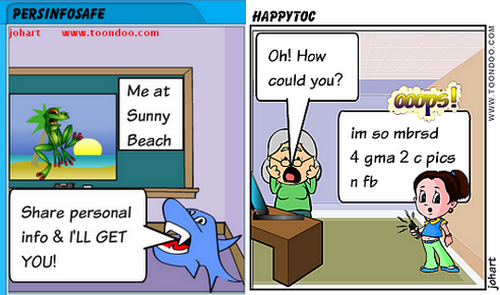 Twitter – longer & longer & lon….! Some musings on recent Twitter changes! These are my personal views about how Twitter works for me and some of the changes that don’t sit easily with me. I would love some discussion to develop around this! I see some changes in Twitter lately that don’t “gel” with me. I’m not that happy with the “newTwitter” web but as I usually use the Tweetdeck client and Snaptu if on my phone this has not really impinged much on me. However I am aware that it is possible to do updates longer than 140 characters. Until recently then these have been shown through my Tweetdeck screen they have either said “read more” so I could ignore them, or have link which when clicked shows a few more words (intensly annoying). However the most recent update shows the whole tweet and (irritatingly) if it is only a couple of characters over 140 leaves a large “real estate” blank in the column! I have always felt very strongly that “Twitter is what you want it to be for YOU!” However this as been very much my personal feeling on the etiquette etcetera of Twitter use. I have no issue with two or more successive tweets to communicate a thought or idea within a conversation I do this myself regularly, although I realise that some people find it annoying. However I am finding it a bit hard to deal with tweets that are just “long” perhaps because the author has not troubled to think before sending or because what they are saying deserves a blog post! a) The impact this may have on the essential character of twitter and very much on the many, many well crafted tweets that I see every day. These being the result of tweeps considering and planning their tweets to say what they want to say in an elegant 140 characters. b) The extra reading time, download and screen space involved – I read very fast and scan and skim for content and context but I know (as a literacy specialist) that not everyone is able to take in meaning rapidly and holistically. This creates the risk that Twitter may become “boring” to some users. c) Longer tweets provide more opportunities for spammers and marketers to monopolise our streams at the expense of those who tweet meaningful content. This was a great session with a lot of sharing and plenty of “take aways” and insights into how and why people use blogs and wikis in their teaching. We had a really good blend of audio contributions, text chat and whiteboard interactions with lots of links shared in text and through web tour. We did a session once before (in late 2009) comparing Nings, Blogs and Wikis and I have found the recording link and added it towards the end of the post. So this week you get two recordings for the price of one! and also a look at where everyone was coming from in terms of using blogs or wikis both with their students and for their own use. Interestingly all participants in the room at that point used blogs but not wikis for their own professional development and/or resource sharing with other teachers. We then moved on to take a look at some of the reasons for choosing either a blog or a wiki and how these characteristics relate to each of the two tools. Next we shared through whiteboard text and some fascinating audio input some of the reasons we use blogs and/or wikis with our students. From my personal perspective it seems that the characteristics are increasingly overlapping with time as the providers of these tools expand the available options for users and also as users become more inventive and knowlegable about them. Although the session was about blogs and wikis we also took a brief foray into alternatives to these as there are an increasing number of alternative ways of publishing on the Internet for both public and closed group contexts. We moved on to web tour a few great examples of blogs and wikis used for specific purposes including: information and “how to” sharing blogs; blended reflective life and work blog; professional and personal development blogs; multiple author blog; resource sharing wiki; and collaborative planning wiki. If you checkout the recording the links for these are live on the relevant whiteboard and there are many other shared links in text chat. Lastly we took a look at what we might do as a result of the session followed by feedback and “take aways”. Here for anyone who is interested is the recording link for the session comparing Nings Blogs and Wikis that we did back in late 2009 – when Nings were still free! We had a really good blend of audio contributions, text chat and whiteboard interactions with lots of links shared in text and throughweb tour, so if you missed this session it is well worth catching up through the recording. Also interesting to compare with the older session from 2009. Our next session is an Edublogs “Serendipity” session on Thursday Feb 17th at 23:00 GMT/UTC (6pm USA EST, Midnight BST) or Friday Feb 18th at 1am CEST, 7am West Aus, 10am NSW, depending on your timezone – in the usual Elluminate room. This is one of our fortnightly unconference sessions where we invite you to bring along your “hot topics” and “burning issues” for our poll on the topic of the day. If you want to propose a topic in advance then visit the Serendipity Wallwisher and add your topic. For this recorded session the topic chosen was from the Wallwisher and was on best presentation practice, however as we were a small number we diverged from this and discussed and shared examples of the options we use ourselves. We started the session by sharing (on the whiteboard) some of the ways that we present our information to others. With a small group these were inevitably limited in number, as I think most people have preferred tools and styles of presentation and will usually use those if practicable. We moved on to discussing and sharing (through application share) some of our own personal examples of how we present information eg interactive PowerPoint, webpages with embedded links and customised Elluminate whiteboards developed on a PowerPoint base. This session was great for gaining insights and ideas from how others present information. My takeways include a need to learn how to make the internal interactives work in Powerpoint and also to take a closer look at using a web page as the thread to link a series of information presentations.